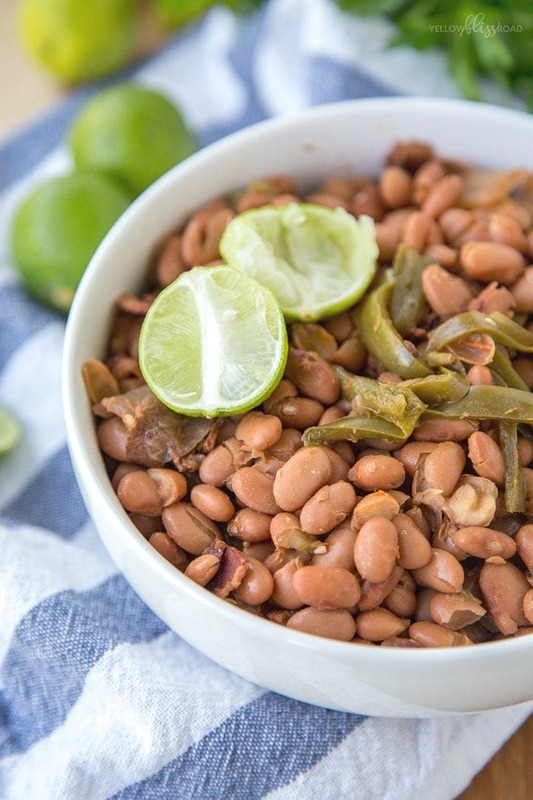 These Slow Cooker Mexican Beans are the best compliment to your favorite Mexican meal. They taste just like an authentic Mexican restaurant, and they are delicious on their own or with my Authentic Mexican Rice. On any given day, if you were to ask me what my favorite type of food is, it would be Mexican. But to be honest, even though we have some great ones in Southern California, I’m not a huge fan of Mexican restaurants. In my experience, you just can’t beat homemade. This particular recipe is another of my cousin’s that is by far a favorite in our extended family. These Mexican beans slow cook, for a very long time – we usually leave them at least 12 hours or so. Trust me when you walk through the door, or get up in the morning you will be met with the most amazing smell. It doesn’t take much to make this delicious side dish. 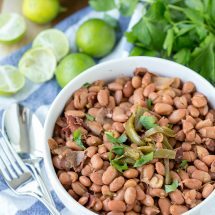 You’ll need pinto beans, garlic, Pace Picante Sauce, bacon, onion, jalapeno, salt and some Calde de Tomate (tomato bouillon – can be found in most grocery stores in the Hispanic foods aisle). You could sub chicken bouillon and a little tomato paste if you must, but I have only ever made these beans with the tomato bouillon. The beans go in dry and they soften and cook as the slow cooker does it’s thing. Pour a bag of dried pinto beans into a colander and rinse with cold water. Pick through them to look for any broken beans or pebbles. 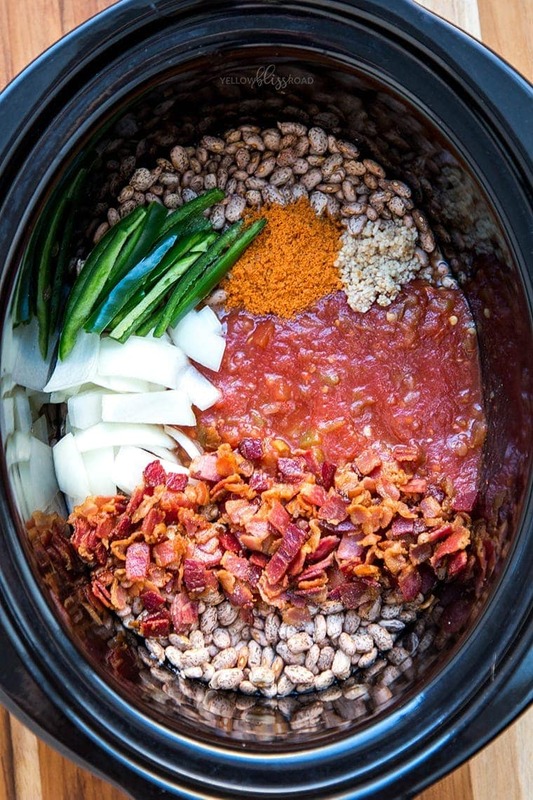 Add the dry beans to the bottom of your slow cooker, then the salsa, bacon, jalapenos, onions and spices. Add enough water to completely cover the beans, then put the lid on and turn the heat to low. I mentioned that these beans take a while to cook. We usually let them bathe in the slow cooker for 12-14 hours. And let me tell you – it’s worth every minute! I will usually put them in the slow cooker the night before and let them cook on low until dinner the next day. Because of this slow cooking method, the flavors have plenty of time to come together and they form this delicious broth that thickens as the beans sit. You can turn them into refried beans too, just use the method in this post. You can see in the photos that we cut the jalapenos and onions a bit larger so that anyone who doesn’t like them can pick them out. You can dice them up small if you like. See that crispy bacon? You can skip the cooking step for that if you want, but you’ll get a richer flavor if you render the fat and crisp the bacon in a skillet first. You’ll want to use a 6-quart slow cooker for this recipe because it will fill it up. Feel free to drain some of the liquid from the slow cooker if you want – there will be a lot. Add a few squeezes of lime juice for a tangy bite. 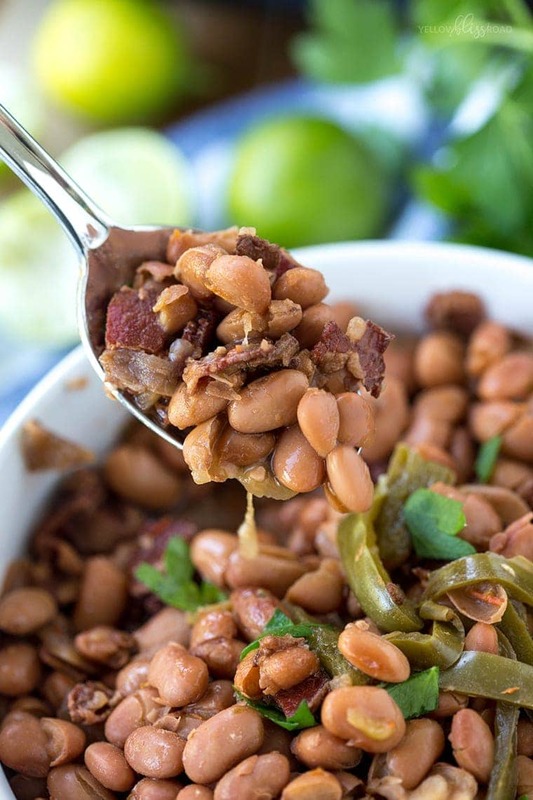 Can you freeze pinto beans? Absolutely! This recipe is perfect for portioning and freezing because it makes a ton. Once the beans are cooled you can portion them into airtight freezer containers or freezer bags. Freeze them for up to 6 months and thaw in the fridge when you’re ready to enjoy them. 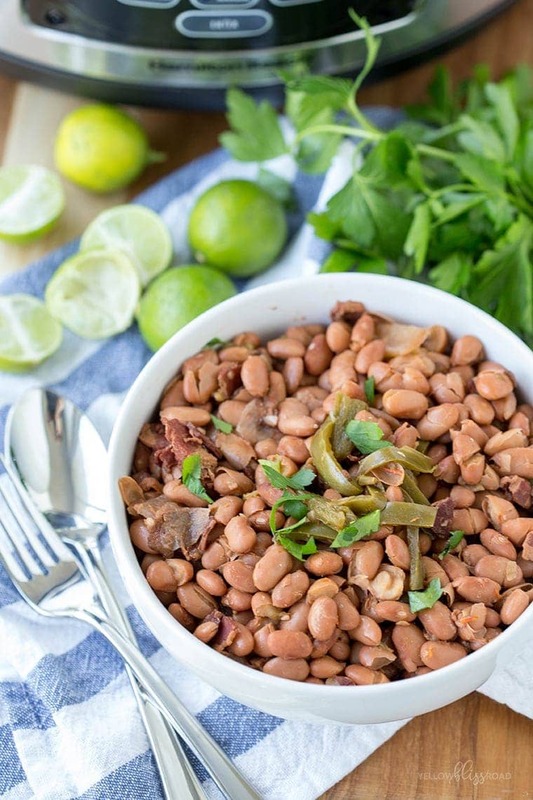 Mexican beans will last about 4 days in the fridge if store properly in an airtight container. Stir all ingredients together in the slow cooker. Add about 5-6 cups of water. 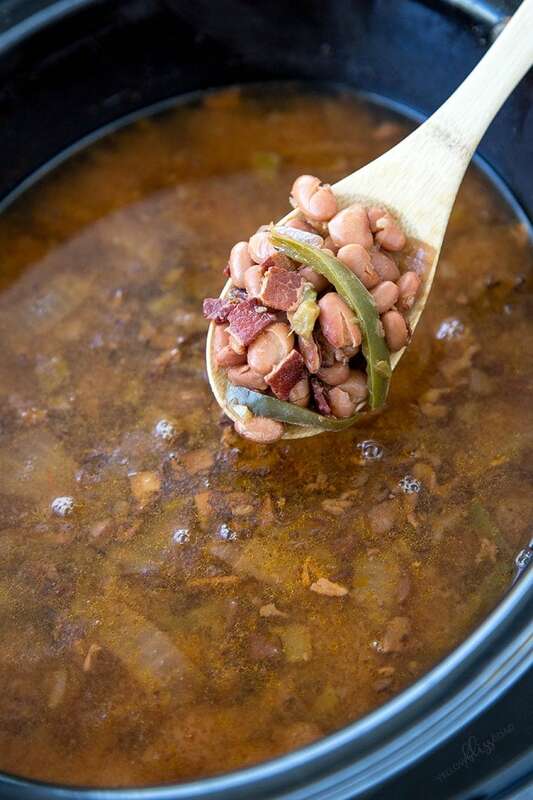 Set slow cooker to low and cook for 12 hours, or until beans are nice and soft. Since slow cookers vary, cook times can vary as well. Can be stored in a sealed container in the refrigerator for 3-4 days, or in the freezer for several months. The site is beautifully done…makes me want to come back for more! Thank you Kristin for the Mexican Rice recipe. I am always looking for that PERFECT one. Thank you Judi, I appreciate your kind words! I made the beans last night. They were a huge hit. I made a lb. and a half. I used 1/2 a jar of pace picante and 1 jar of herdez medium sauce. I used a. Lg can of dice green ortega chili’s instead of jalapenos due to our daughtwr is allergic to jalapenos. And followed all the other ingredients adding an extra 1/2 to everything. They turned out amazing. We couldn’t stop eating them. This is so good! Made them today for Christmas! What is the salt measurement? It depends on how salty you like it. I’d start with 1 teaspoon (maybe less), then salt to your liking once they’re finished cooking. Can i put on high and if I do what would u recommend on how’s long? You could put it on high. You would want to check the water periodically and add more as needed. The slower time produces a more tender beans.